Wow what a suprise, Jimmy puts out an album unlike anything else out there. The instrumentals are great to listen to, the track with Corgan doesn't even sound like Zwan or Smashing Pumpkins. I'm amazed Chamberlin pulled off a good sound without really rehashing anything that made the Smashing Pumpkins or Zwan so popular. The drumming in this album is breathtaking, I'm so happy to hear Chamberlin's complex beats hit the airwaves again and I hope we'll hear from Chamberlin again in the future. "Life Begins Again" is one of the most original albums I've heard in a long time. The Complex simultaneous mixes jazz and rock music making a hybrid unlike anything before. The album is fairly diverse in sound, and ranges from harder songs to softer ones. Songs like PSA contain loud and crunchy guitar riffs filled with so more energy that you'll be drawn in almost instantly; whereas Lokicat moves to the beat of a dreamy drum riff complimented by soft guitar that could easily put one to sleep. Although different vocalist sing on the album, the vocals all carry the same soothing tone. The bass and keyboard riffs carry a jazzy tone which somehow fit into the rock guitar really well. Jimmy Chamberlins drumming really powers the band, packing a punch into almost every song on the album. The diversity in style on the album along with The Complex's hybrid which I like to call 'progressive jazzy rock' makes this album interesting and unique. If you're looking for something that rocks and is fresh, I suggest you take a listen to the album and see what you think. When I first listened to "Life Begins Again", like everyone else I had no idea what to expect, except great expectations. First let me say, this album is not something you can hear once and grasp. To get the complexity of the complex you will have to spend the time with a decent sound system to hear all the tracks, front to back. The album opens with Street Crawler, upbeat at times, insane at times, but a driving song and a great way to start an album. It paints the picture that you're listening to a band with enormous talent. A true jam band if I had ever heard one. I don't have to stress Billy's talent on the bass, it stresses itself. Second track Life Begins again, bringing in the vocal element to JCC, featuring Rob Dickinson, front man of the mia band Catherine Wheel (long time partner in crime of the Smashing Pumpkins). It was a good decision by whoever decided to put Rob on the track, because you can almost feel that mid 90's pop alternative era with dirty riffs, melodic piano, and ethereal guitar. Rob eerily echoes in concert with Sean's guitar, the song creates an atmosphere, an easy one to slip into and stay in. It carries over to PSA, which seems to be a playground for the band, Jimmy just lets go and really showcases himself in a way I've never heard before, and it meshes beautifully. Something I've come to understand about The Complex is they can tear apart and bring any song back together in a unique way that makes you feel you've just listened to 5 songs in one. The next song Lokicat quickly became my favourite song, but it was not the introduction of Billy Corgan's vocals that did it for me but rather a drum lick so unique it could be a song itself. The first 10 seconds of the song grabs you in and keeps you in to the end. Corgan lends voice in a very familiar vocal progression which takes you back to his earilier years. This song is unfortunately the only reunion of the duo on the album. Cranes of Prey is the odd one out on the album, a consistently new edge metal sound, it snaps you out of the Lokicat daze, but not immediately. Distant sounds of the Rhodes breaks you in and keeps a common theme in the song, as the guitar, bass and drums take you from heavy to spacey and back. The Jazz aspect of Billy's bass will drive bass enthusiasts nuts, as JCC once again reaches new heights. But the five minute song quickly drops off leaving it a tad lacking. Rob Dickinson once again joins the team for Love Is Real. The composition of the song is a bit awkward, quick and poppy, but brings back some very familiar drumming. It also further shows Jimmy has found a new leaf to turn over as a lyricist. The next song Owed To Darryl is a 5 minute jazz jam that will give audiences a taste of what to expect live with off the wall performances. Newerwaves with a strongly driven bass line delivers a punchy song with Billy Mohler making an excellent vocal presence which seems to meld with the song rather than stand apart from it, again showing you that the Complex is an all around instrumental band, viewing the voice as another instrument to add to the song, not carry it. Time Shift is a transition song perfectly used to connect Newerwaves and Lullaby to Children and wind the album down. Lullaby, with Bill Medley's dark vocals, is a wonderful and moving song. It's one of those songs that makes you feel satisfied about the album you just listened to. A key element to the progression of Life Begins Again. Wrap it up with a reprise of Lokicat and all in all you have a complete, well put together showcase of creativity and talent. If you have any doubts about getting your hand on this album, discard them. The Complex breaks out of the ordinary, creating an environment of their own. Life Begins again is a vacation from the mundane world of modern rock and reminds us what instruments are really for. Good stuff!!! The best songs are Loki Cat, Streetcrawler, Timeshift, and owed to Darryl. Original and fresh, a good getaway from the same music everyone else plays. So far, the Jimmy Chamberlin Complex is my favorite of the solo attempts of any of the former members of the Smashing Pumpkins. This album features some really great guests, even Billy Corgan and Rob Dickenson of Catherine Wheel. While Corgan�s solo attempt (THE FUTUREEMBRACE) gives the impression that he wants to run like hell from ever being mistaken for �that guy who used to be in the pumpkins� and abandoning a sound that made him famous and adored worldwide, Chamberlin revels in it. From note to note, there is absolutely no mistaking who is behind the drum kit, and the other musicians of this piece of work aren�t too bad themselves either. 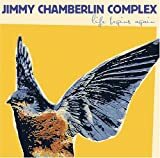 The Jimmy Chamberlin Complex debut is ironically named �life begins again�, but the mood and musicianship of this disc shows that life has never stopped for him to begin with.